When was contacted by both Save the Children and The Biscuiteers about Christmas Jumper Day I was inspired to not only get my Christmas jumper on, but also to make these gorgeous Snowflake Biscuits! 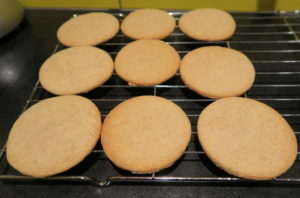 They are made from a basic biscuit recipe that I’ve added cinnamon to for festive flavour. I’ve decorated them with both regular icing sugar mixed with water, and fondant. They are such pretty biscuits and would make lovely edible gifts for your family and friends at Christmas, or just a nice treat to enjoy together! 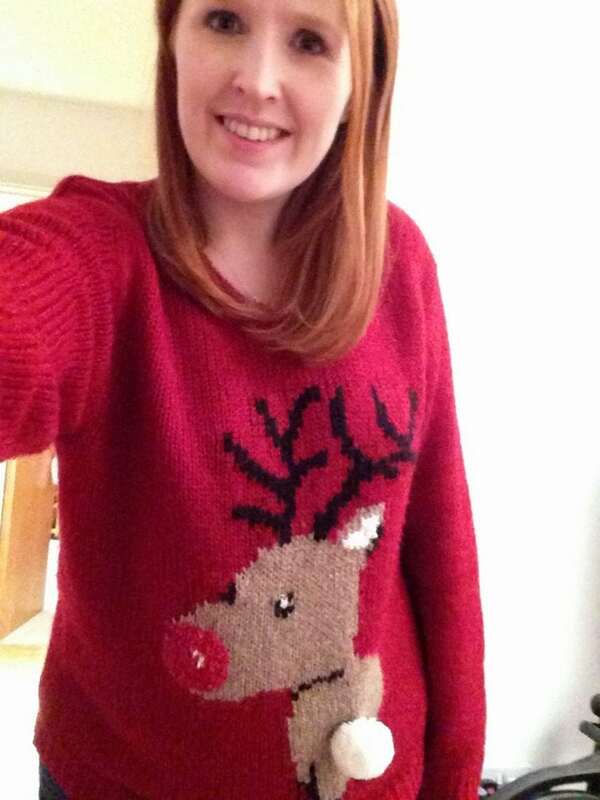 Here’s me in my Christmas jumper! 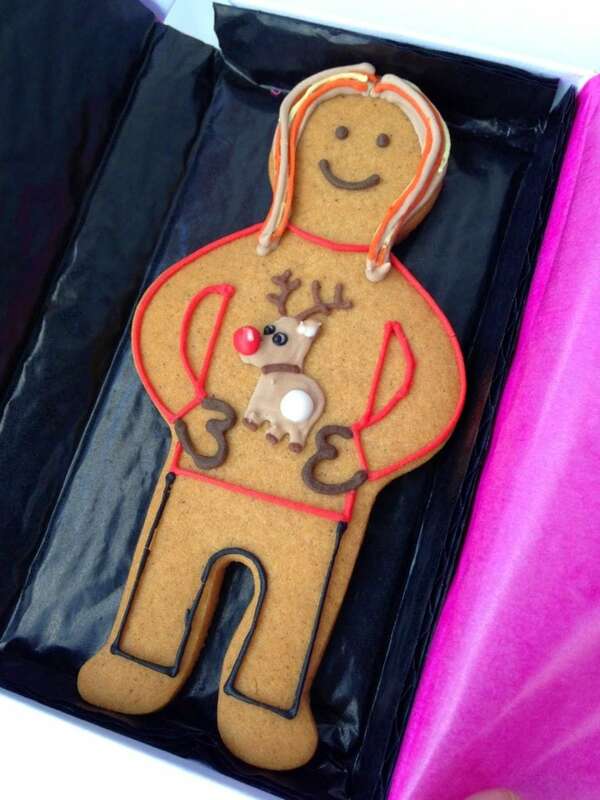 And the biscuit likeness sent to me by The Biscuiteers, isn’t it fantastic?! Their speciality are beautifully iced biscuits that they send out in gorgeous tins. 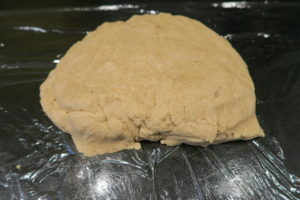 To make the dough I creamed together butter and caster sugar. 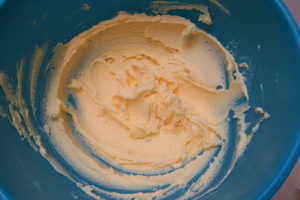 I then added egg and vanilla extract, and mixed well. 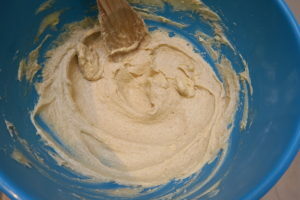 Next I added plain flour, baking powder and cinnamon, and mixed to form a dough. Then I wrapped it in cling film and chilled it in the fridge for 1 hour. I’ve made these biscuits using snowflake cutters in the past, but they are pretty tricky cutters to use because they are so intricate. 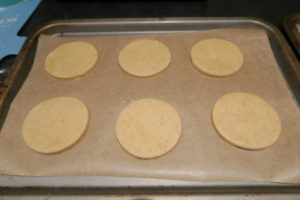 For me the best way is to do circular biscuits, and then decorate them afterwards with pretty snowflake patterns. They baked for 10 minutes, until they were just going golden at the edges. I cut out some snowflake shapes from light blue fondant and I also made a thick pipeable icing from icing sugar and water to decorate the Snowflake Biscuits. 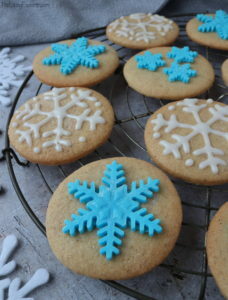 You can decorate the biscuits anyway you like – snowflakes are unique after all! I also added some silver edible glitter spray for extra sparkle. Biscuit recipe slightly adapted from Bake Space. You can find more of my Biscuit recipes by clicking here! Or click here for more Christmas recipes! Love the biscuiteers! Yum! 🙂 These also look fantastic, really pretty and so festive! Thanks Stuart! A steady hand and taking it slowly is my advice!